During the early 1920s the Federal Government began receiving disturbing reports, apparently based on actual field observations, that populations of northern caribou were in steep decline and that the Inuvialuit of the western Arctic and Inuit further east would soon be starving. The Americans had faced the same problem in Alaska in the early 1890s. They brought in a large herd of European reindeer and attempted to establish reindeer herding as a way-of-life for the Inuit of northern Alaska. 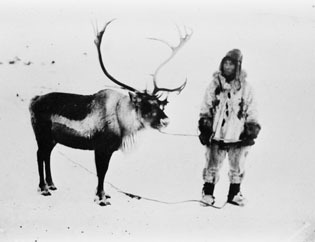 In 1929 the Canadian government followed suit and entered into a contract with a company in Nome, Alaska for the delivery of 3000 reindeer to the Canadian Arctic. On March 6, 1935, after a five-year trek across northern Alaska and the Yukon, 2370 reindeer arrived in the Mackenzie Delta. The government’s plan was to take young Inuvialuit from Church-run residential schools and train them, during a three-year apprenticeship program, in reindeer husbandry and herding techniques. Each graduate of the program would then be made responsible for a herd of reindeer and set up in an area east of the Mackenzie Delta near Reindeer Station (map) where they would take care of these reindeer and sell the offspring. This sounded like a good plan but in reality the return, even from a herd of a thousand animals, was much less than one could make as a hunter and trapper. To make matters worse reindeer herding was difficult and lonely. During the first few years of operation only two men came forward to become apprentices. From 1935 through to the mid 1950s only seven independent herds were established. During that twenty-year period there were a number of setbacks including the sinking of the Inuvialuit schooner Calla in September of 1944. Eleven people drowned including a number of key Inuvialuit reindeer herd managers. The end to this government experiment happened rather slowly over the later half of the 1950s and came about because of the lure of good paying construction jobs on two major northern projects, the DEW Line and the building of the new town of Inuvik. In 1960 the federal government admitted defeat, the herd was sold and today continues to be privately owned.